I was determined to make a pie this Thanksgiving. 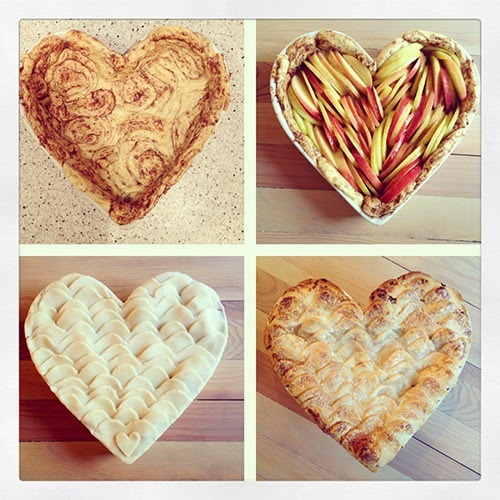 I've seen so many beautiful pie crust tutorials on Pinterest that I really wanted to try my hand at it. This is one way to get me interested in cooking/baking– make it a creative, artistic activity and I'm all for it. Otherwise, I'm totally disinterested (much to the husband's chagrin). My BFF works for a grocery chain and literally has a job where she tastes baked goods and makes buying decisions in the store's bakery, so of course I recruited her to help me. We put our own spin on a couple of different Pinterest ideas, using cinnamon rolls for the bottom crust and premade pie crust to decorate the top in a scallop pattern. We used this recipe for the pie filling, but with gala apples that I already had on hand. 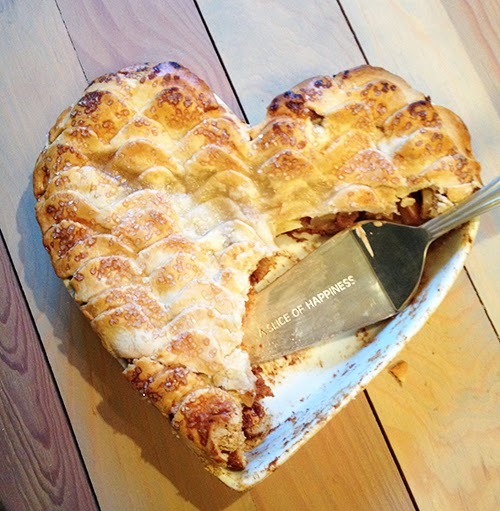 Of course I had to add the cute little heart at the bottom to match my thrift store pie plate! Kelsey used this cool app called Flipagram to make a video slideshow of the pie making process. We didn't have any cookie cutters so I just used a nice to cut the scallop pattern into the pie crust by hand. It was delicious! We agreed that we would just use regular pie crust for the bottom next time because it would be easier than the cinnamon rolls and taste just as good. 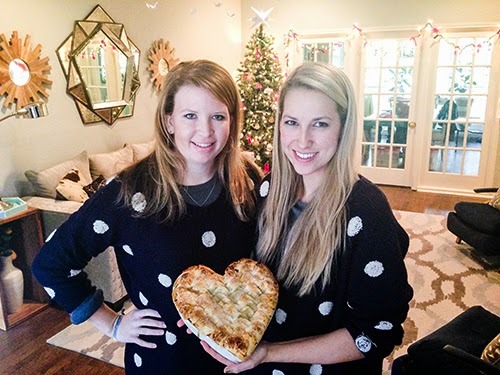 True best friends wear matching sweaters and bake together. That's a fact, Jack. I'm also getting ready for my holiday tablescape party at church tomorrow night. 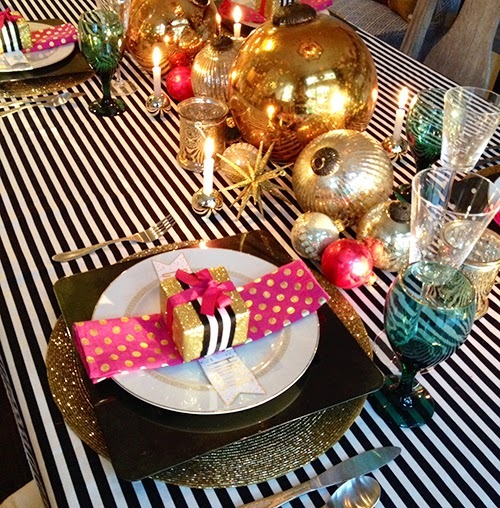 I'll be setting up my "Happy Glam Chic" table tonight after work, so I'm excited about that. I can't wait to share photos and DIY details with you. I did a practice run in my own dining room, so here's a sneak peek! I'm really excited to share our Christmas decorations with you, but I haven't been able to take good pictures because it's always dark when I get home from work (#bloggerproblems, I know). I'm working on it and will have that post ready as soon as I can!